Google Images now contains Life Magazine’s vast photo archive. If you’re old enough to remember the heyday of home delivered magazines, you will most certainly remember that glossy, oversized, highly visual catalog of each week’s events. It was spectacular. Buried in that archive are a nice set of knitting-related images, mostly from the 1930s and 1940s. Most of them are from three issues, a 1939 one on knitting for the British army, a 1941 how-to-knit issue, and a 1952 home/baby knitting article. The accompanying articles aren’t in this archive, but the how-to and finished object pictures that formed the core are. There is also a smattering of celebrities at rest/with family pictures, some travelogue/news shots of women knitting abroad, and a couple of college girls knitting from the late ’40s/ early ’50s – the last time there was an on-campus knitting fad. The “Janes Booties” (at right) I often knit are one of those much loved, scribbled-on-an-envelope patterns passed hand to hand. The version I use was posted to the KnitList by Ann Kreckel in 1995. I did a step by step how-to for Ann’s pattern in 2005. Extremely similar patterns have appeared in a letter to Threads Magazine, and in the 1999 Knitters Socks Socks Socks competition book. The Threads letter was printed in the 1991s, and was penned by an elderly lady who said she’d been knitting them since her girlhood. My guess is that the ur-source for this pattern might have been a magazine article or leaflet appearing sometime between 1900 and 1920. I’m always on the lookout for earlier manifestations of Janes Booties so this shot grabbed my attention. The Life magazine bootie looks a bit squashed and shallow compared to my green bootie, but I can see that it shares basic construction with the pattern I use. First, the bottom looks to be a rectangle of garter stitch. The sides of the bootie look like more garter stitch picked up around the edge of the sole plate strip, then knit in the round. The top of the toe looks like it was worked flat, back and forth, culminating with the tube-knit ankle part, worked in the round on the ankle stitches plus those from the top of the foot. Eyelets form the holes for the tie string. 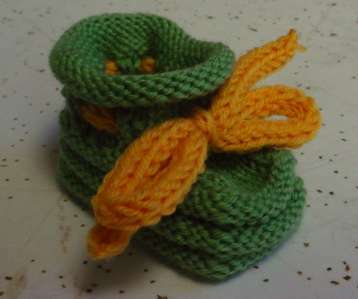 While the Life bootie is much less plump, with a shallow toe area and overall less boxy appearance (no garter stitch welts to form the sides), and ended off in a plain garter anklet rather than a rolled stockinette top, it was made the same way. I’d consider it a first cousin to Ann Kreckel’s pattern. If anyone spots earlier incarnations of similarly constructed booties in historical sources, please let me know!